The results suggested that there was a set hierarchy in wolves, in which 'alphas' (leaders) had first access to important resources, forcefully maintaining the group structure through displays of aggression to others. Because it was also thought dogs descended from these wolves, it was then assumed that similar social groupings and violent 'pack' dynamics must therefore exist among domestic dogs as well. This theory became so popular that despite the obvious fact that dogs and wolves are separated by thousands of years of evolution and that dogs and humans are completely different species, the theory was used to explain the social interactions between dog–dog and people-dog interactions suggesting how dogs should be trained. However dogs are not wolves, and even if they were, those captive wolf studies have since been renounced by the very scientists who performed them and withdrawn their original conclusions in relation to wolf behaviour (and therefore are even more irrelevant when applying to domestic dog behaviour). It was thought until very recently that dogs were wild until about 12,000 years ago. DNA analysis published in 1997 suggests a date of about 130,000 years ago for the transformation of wolves to dogs. This means that wolves began to adapt to human society long before humans settled down and began practicing agriculture. This earlier timing casts doubt on the long-held myth that humans domesticated dogs to serve as guards or companions to assist them. Rather, say some experts, dogs may have exploited a niche they discovered in early human society. These dogs were not part of aggressive wolf packs, but bold and friendly scavengers. Dogs have almost identical DNA to wolves however many thousands of years of domestication have made them considerably different animals. Humans share 50% of the same DNA with a banana which I'm sure everyone can agree humans are not the same as. Dogs are not socialized wolves anymore than humans are better developed bananas. Not only has domestication set them apart physiologically, but it has greatly influenced their emotional development as well. The difference in developmental stages between wolves and dogs in early life is acute enough to affect their ability to form social relationships throughout their lives. "People have been studying American timber wolves (the grey wolf) because the European wolf is virtually extinct. And the American timber wolf is not related at all closely to the ancestry of the domestic dog. Domestic dogs were descended from more sociable wolves but that whatever the ancestor of the dog was like, we don't have it today"
What are the problems with pack theory? • Dogs have changed a lot since domestication, and groups of feral dogs (a domestic dogs nearest example of a wild relative) do not have the same social structure as wild wolves. They breed, feed, hunt and live completely differently. • Pet dogs live completely different lives to even feral dogs, never mind wolves. They often live with no other dogs or with the same group (who they don't choose), an owner chooses their food, controls when they eat, exercise, reproduce, play etc. NOTE: aggression is not a sign a dog is trying to dominate the handler. It is simply a form of communication that EVERY dog has the ability to use. If early signals are ignored by the handler, the dog will simply use more obvious signs of aggression until they are understood. If a dog is punished for showing aggression they will simply skip the small signals (which the owner has forbidden them to show but the state of mind remains the same) and you get dogs that appear to be aggressive 'out of the blue'. Despite what some media and pack theorists may tell you, dogs are not trying to climb to the top of the household through dominating behaviour and become the leader or 'alpha'. Many people believe that bad behaviours are caused by a dogs desire to be the dominant one in the relationship. This is simply untrue. The majority of dog behavioural problems actually arise from an insecurity and/or a desire to seek and maintain safety and comfort and is not from a pre-programmed need to be 'dominant'. If an insecure dog is aggressively challenged, forced or further scared by the owner - the dogs original insecurity is just reinforced. Dominance in dogs does exist - but is a term often incorrectly used. Example 1: A dog jumps up - the owner thinks the dog is trying to dominate them. Reality: Jumping up is a natural behaviour that is easily unintentionally reinforced. 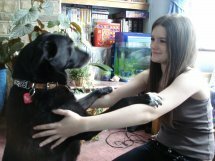 A dog may learn that it is an acceptable way to greet, a good way to get something it wants especially attention (even negative attention is worth it to some dogs) and it's often self rewarding and enjoyable. Solution: Prevention is better than cure but if a dog is a persistent jumper - consistency and pre-planning of situations it paramount. Example 2: a dog growls when its owner approaches the food bowl - owner interprets this as a sign the dog wants to fight to achieve 'alpha' position - the owner forces the dog away aggressively- the dog learns it had every right to try to fear the owner coming near the food and it's need to guard the food. Additionally, to get what they want they know swift aggression without warning or concern for their communication is required. Solution: the dog growls as the owner approaches - the owner stops and understands that the dog is clearly communicating that they are feeling insecure about them being near their food - the owner turns away from the dog and chucks something tasty into the bowl from a distance and retreats - the dog learns that the owner coming near the bowl is not a bad thing as the dog gets something tasty to eat, they're not trying to steal the food and there is no need to guard it (with further training). This is then repeated until the dog is comfortable with the owner being next to the bowl. The dog has not learnt that growling is the 'solution'. Growling is just communication, by showing we can reach an understanding through understanding of this communication there is no need for further conflict i.e. the dog does not need to continue the aggression or raise the level of severity to snapping or biting.